FUNCTION: BLOG: In praise of accepting praise. Compliments have always been difficult for me to take. Even as a kid, a pat on the back was humbly accepted, though I thought not usually deserved. I attribute this to a very peculiar disease of which I am a sufferer: perfectionism. For me, it's never quite done.. Rarely quite right.. And certainly not good enough to pass my own stringent standards. But a couple of weeks ago, I got a good teachin' on how to take a compliment. Around the middle of June, Architectural Record and McGraw Hill Construction announced the annual winners of their Advertising Excellence Awards, which recognize the most effective ads in the building and design marketplace. And guess who was at the top of the list? Function:! The ad I created for Kawneer's continuing Sustainability campaign was graced with the Best in Class stamp. And I must say, I do love this ad. It's clean and minimalist and reflects an aesthetic I've long hoped a client would jump on board with. 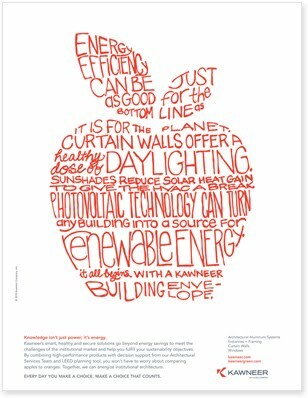 But it also very effectively illustrates Kawneer's commitment to sustainable products and practices; the ad is about building a healthy environment with knowledge, something that Kawneer does and helps their customers do. The real kick in the pants came with this judge's comments: "It stopped me in my tracks and compelled me to read more. I read every word of it, yet it never even showed you the product." Boy, is that a compliment or what! Go team!! But what really makes this win feel amazing? Knowing that we did the very best for our client, made a beautiful and smart ad, and that it works. Because design isn't design if it doesn't communicate. So I graciously accept this compliment, though it's not merely mine to accept. But I doubt it'll do much to remedy that pesky case of perfectionism.